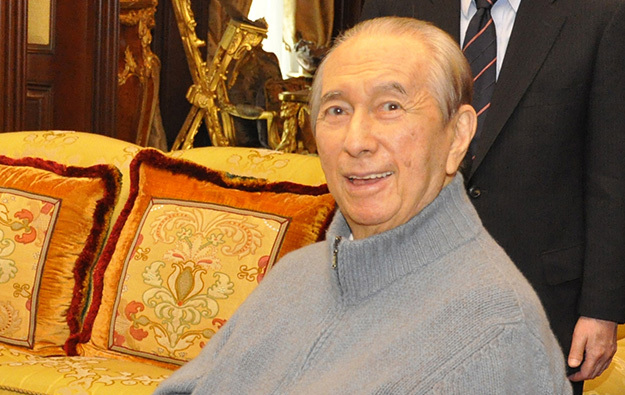 The third consort of Macau former casino monopolist Stanley Ho Hung Sun has denied Hong Kong media reports that his health has seriously deteriorated. Ina Chan Un Chan spoke to the media outside the Hong Kong Sanatorium and Hospital in Happy Valley on Saturday alongside her daughter Laurinda Ho Chiu Lin, one of the 97-year-old businessman’s 17 recognised children from an aggregate of four consorts. “He is in good shape. I don’t know why there were such rumours,” Ms Chan was quoted on Saturday by the South China Morning Post as saying. She added that Mr Ho (pictured in a file photo) had been able to eat and to communicate with family members. On Friday, some local media reported that Mr Ho’s health had worsened, and suggested he was receiving emergency medical care and that doctors had asked family members to ensure attendance at the hospital. Local media accounts also stated several other of the entrepreneur’s children – including Daisy Ho Chiu Fung, who took over from him last year as chairman of SJM Holdings Ltd, the Macau casino operator that he founded for operations the post monopoly era – had attended the hospital over the weekend.